2014 Kuberg Start. Picture credits - Kuberg. Submit more pictures. KUBERG START is the perfect launch pad into the motorcycle�s world. 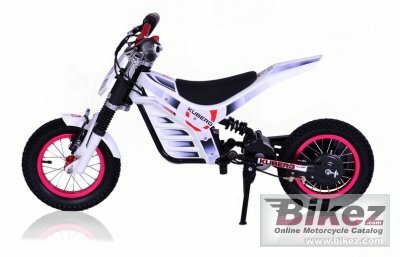 With seat height just 16� (40cm) and weight bellow 45lbs (20,5 kg) is Start designed for riders from 2 to 5 years old. Quality design with full coverage of batteries and chain guard, the parental speed dial control, great suspension, this bike is functionally brilliant, while still being very safe when used responsibly. The first riding experience for your children can be good, not intimidating, noiseless, easy and fun! Seat height: 406 mm (16.0 inches) If adjustable, lowest setting. Comments: 6 hour charging time. Intended for children. Ask questions Join the 14 Kuberg Start discussion group or the general Kuberg discussion group.